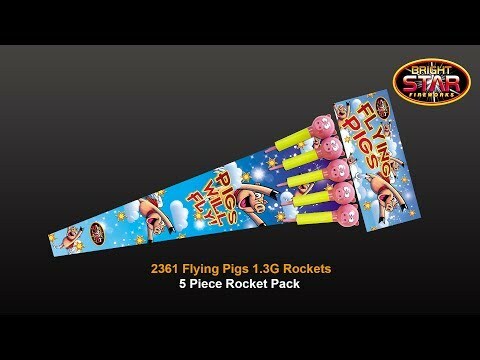 The Flying Pig Rocket pack are one of the best performing rockets you can get for their size. They are almost a meter long with a 2" ball-head. These rockets are 1.3G meaning they have more explosive content in them for that bigger bang and spread of effect, hence their great performance. Have a look at their video to see just how good they are! Free delivery with orders over £299 (UK Mainland Only and excluding postcodes at the bottom of this section) - please note, this is calculated AFTER any discounts have been applied. Alternatively you can collect from our Head Office near Luton so as not to incur any delivery charges. Express delivery two working days ON ALL ORDERS. E.g. an order before midnight on a Monday will be delivered on a Wednesday. An order placed before midnight on a Friday will be delivered the following Tuesday. Scotland, Scottish Highlands & Islands deliveries will incur a £75 surcharge over and above any other delivery charges below £500. Please note, in terms of delivery classification only, Fantastic Fireworks does not class the Scottish Highlands as a part of UK Mainland. In the event of order cancellation, a 10% administration charge is applied and this must be covered, as well as the cost of sending the items back to our head office at Rocket Park, in Hertfordshire. Unfortunately we cannot currently deliver outside the UK or to the following locations: Northern Ireland, Republic of Ireland, the Isle of Man, Isle of Wight, Channel Islands, the Isles of Scilly and the following postcodes: AB33-38, FK15+, G83+, HS, KW1+, PA20+, PH6+, FK15+ ZE and all Scottish West Coast Islands. We can though deliver to a shipping company or nominated address for onward delivery. © 2019 Fantastic Fireworks. All Rights Reserved.